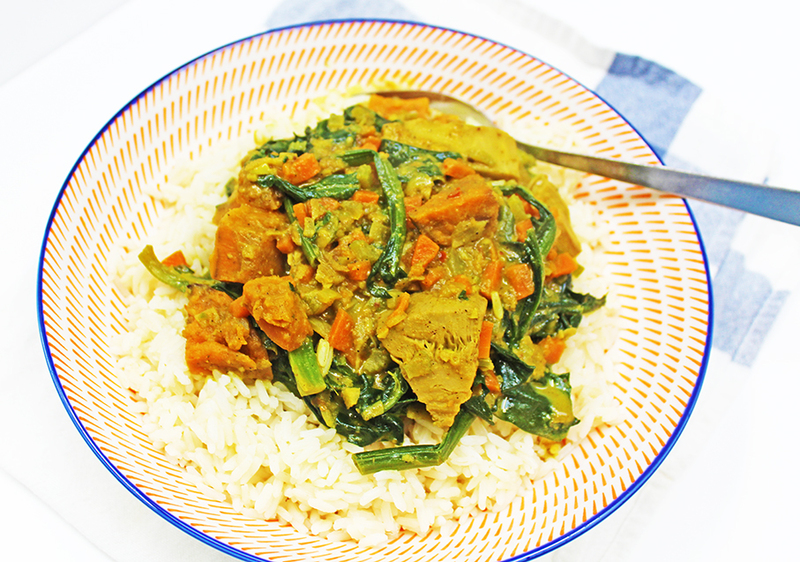 This is a very tasty Vegan curry using Jackfruit. Jackfruit is a great meat substitute if you are trying to cut out meat. Use in curries, stews and anything else that takes your fancy! Place sweet Potatoes and Jackfruit in a roasting tin with olive oil and roast for 30 minutes. then set aside. In a saucepan on a medium heat add olive oil and onions and fry until golden brown. add garlic, ginger, celery and carrots, stir and cook for 5 minutes. Add the curry powder, stir coating all the vegetables in the curry powder. Add black pepper and thyme leaves, coconut milk and vegetable stock, stir and bring to the boil. Turn down to a simmer and cook for 10 minutes. After 10 minutes, add roasted sweet potatoes, jackfruit and spinach leaves to the curry sauce and stir. continue to cook for 5 minutes. Check seasoning, remove from heat and serve with rice. Jackfruit can be bought in tins or fresh (depending if it’s in season) from Chinese supermarkets or online (try Amazon).